CARLSBAD, CA . . . Torrey Pines Scientific announces its NEW EchoTherm™ Programmable Corrosion Resistant Digital Stirring Hot Plates for use with aggressive chemicals in environments where other stirring hot plates would be quickly destroyed by vapors or spills. Heater tops are 8" square solid ceramic with 600 watts of power. Temperatures can be set to 450°C. The units are readable and settable to 1°C. Accuracy is 1% over the entire temperature range. Temperature control is by PID software and is controlled to ±1°C or ±1ºF. 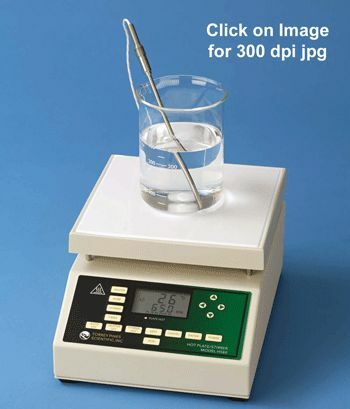 Stirrer speeds can be set from 100 to 1500 rpm. Temperature ramping can be set from 1ºC/hour to 450ºC/hour in 1ºC increments. The built-in timer is settable to 99 hours and is readable to 1 second. It has an audible alarm with user settable auto-off for turning off the heater and stirrer when the timer counts down to zero. The units are supplied with a 6” Teflon immersion probe for controlling solution temperatures directly. All units are available in 100, 115, and 230 VAC, 50/60 Hz models. They are "Made in the USA" and are UL, CSA and CE or equivalent agency certified and available in voltages for use anywhere in the world.